Variation Accepted: Operating between TAVISTOCK Bus Station and PLYMOUTH Bus Station given service number 83/185/185S/83A/83D/84/84A/85/86 effective from 31-Oct-2010. PH0004983/328 - FIRST DEVON & CORNWALL LTD, THE RIDE, CHELSON MEADOW, PLYMOUTH, PL9 7JT. 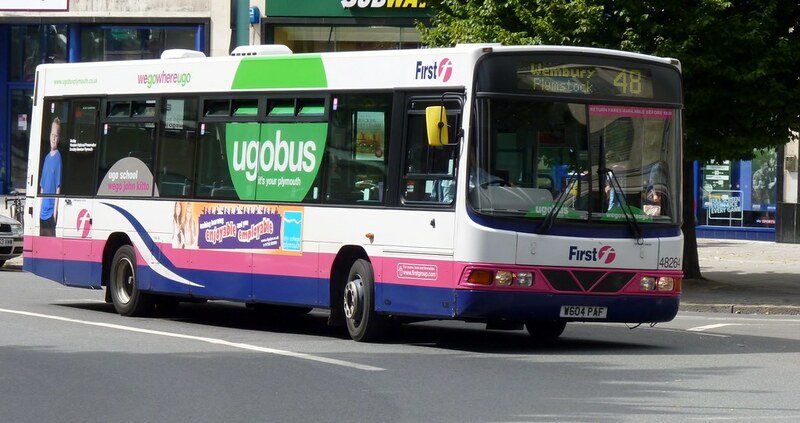 Variation Accepted: Operating between Plymouth Royal Parade and Keyham given service number 4 effective from 31-Oct-2010. .
PH0004983/396 - FIRST DEVON & CORNWALL LTD, THE RIDE, CHELSON MEADOW, PLYMOUTH, PL9 7JT. Variation Accepted: Operating between City Centre and City Centre given service number 15 effective from 31-Oct-2010.. Variation Accepted: Operating between PLYMOUTH Royal Parade and KINGS TAMERTON Steph.Way given service number 16/16B effective from 28-Nov-2010. Variation Accepted: Operating between Plymouth, Royal Parade and Plymouth, Royal Parade given service number 46 effective from 28-Nov-2010. More tinkering with the 46/47 - these routes have probably changed more times than any other Citybus routes this last few months. I am guessing this is adjusting the routes through Kings Tamerton taken by the 16 and 46/7 although it may just be coincidence that both of these routes are changing. Cancellation Accepted: Operating between WEMBURY Southland Park Road and NOTRE DAME SCHOOL given service number 48 effective from 28-Nov-2010.